©2013, Joan Desmond, doodle detail. Webster’s defines doodle as: (to) dawdle; trifle; an aimless or casual scribble, design, or sketch; also: a minor work; Synonymous with fooling around, messing around, fiddling, puttering, etc. The definitions imply that simply making marks on paper, idly, is something unworthy of serious consideration. I once believed that also. My understanding is different now. Now, I see doodling as very similar to intuitive painting. Art is all about making marks. As a method, doodling is a great brainstorming, block breaking, and creative thinking exercise. Much different than an observational drawing or a planned composition, drawing without a set goal can access the subconscious and key into universal symbols, such as the circle, spiral and triangle. Doodling can also be a starting point. A writer will scribble a word or bits of thought on a scrap of a paper, a napkin, or a receipt, ideas that may develop into an essay, a poem. Similarly, a doodle may be the seed of something else, lead to new directions, highlight concerns, or exist on its own. Here, my doodle detail reminds me again of a love of pattern, and oh Yeah! a reoccurring artistic preoccupation with all things bird, wings, and flight. 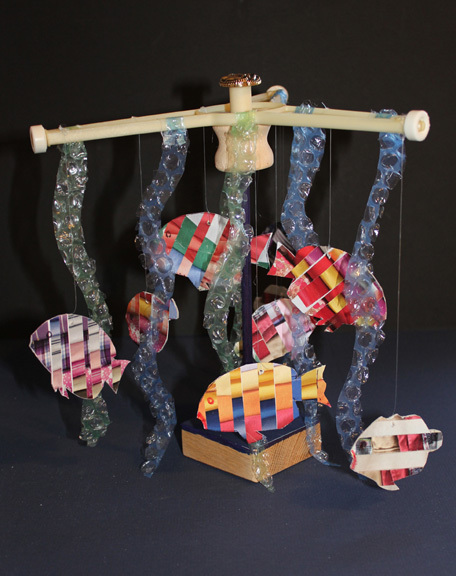 ©2012, Joan Desmond, Fish-Go-‘Round. assemblage. Fish are patterns, stripes, dots, chroma, shimmer, and flashing movement-darting singly, or en masse. 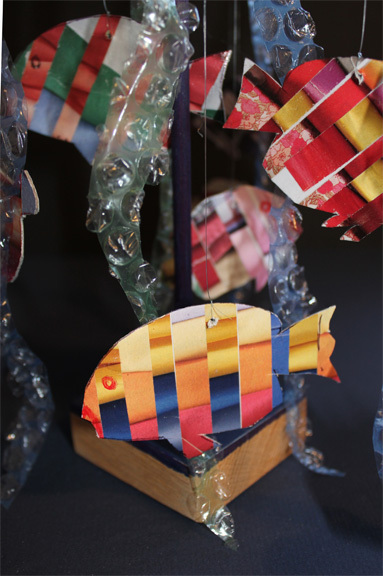 Fish fascinate me and are recurring subject matter, so the idea of “fish mobile” came readily when thinking of something kinetic. Although this piece doesn’t go ‘round & ‘round, the fish shapes bob and sway easily with a puff of breath or nearby vibration. Created from wood scraps, wood dowel, a kitchen appliance part, colored bubble wrap, button, cardboard, clothing catalogs, non toxic markers, and fishing line. Birds anyone? Organic shapes like Alexander Calder used? Leaves perhaps, geometrics…what else may dangle free in a mobile? 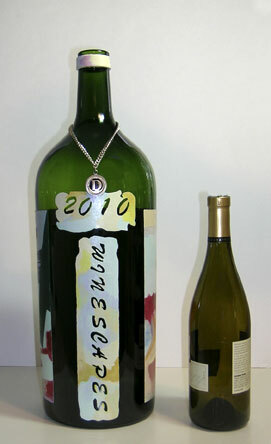 Until I hefted one I really had no idea how big a 6-liter wine bottle was. 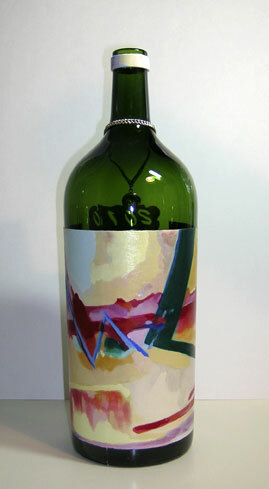 The idea was to “art it up” for a benefit auction at the Bakersfield Museum of Art. I had never worked with a bottle before. 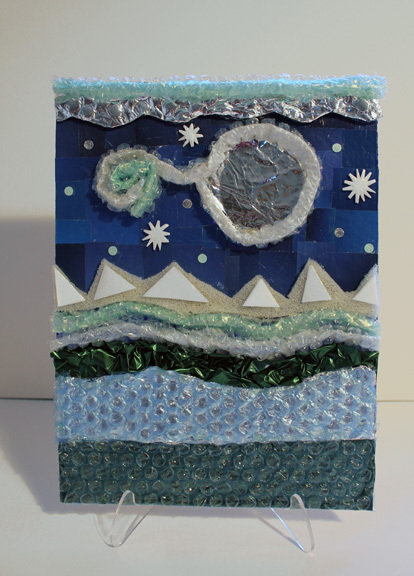 When you first brainstorm on an art project, tons of ideas come to mind. You entertain all ideas, from the silly to the fantastic. I considered drilling holes, attaching metal extensions, etching into, gluing onto, putting inside off, shall it be wrapped in grapevines? The whole gamut entertained just to shake loose ideas. In the end the decision was to paint onto. I do love to paint! I’m also painting other landscapes. The idea of a Dionysius ‘scape seemed fitting. I practiced on a couple of smaller bottles to see the effects of the various mediums on glass. The final decision included some of the luscious interference and duochrome acrylic paint from Daniel Smith. They give the image a rich, reflective quality. I also wanted to keep some of the glass exposed as there is always a relationship between the material and the message, and this was a “glass-see-though-with-depth bottle”. For the main image, which you may recognize as a re-creation of a much larger, 62″, oil painting of mine, a thin application of Yes Paste was used to attach a rectangle of paper. This gave it opaqueness and surface stability. Then a layer of gesso was applied and then the paint. The lettering is in acrylic applied to the glass over gesso, with no paper. Afterwards, for a protective coat it was sealed with thinned Golden Soft Gel. So just how large is a 6-liter bottle? Here’s a comparison.